Dynex Technologies announced today it has received approval from China’s State Food and Drug Administration (SFDA) to market the DSX® automated enzyme-linked immunosorbent assay (ELISA) processing system in China. 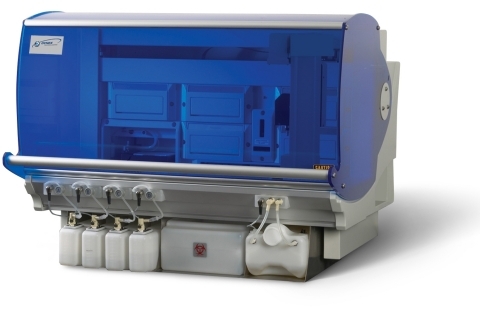 The DSX is Dynex’s industry leading automated ELISA processing system for diagnostic assays in clinical laboratories, capable of quickly and accurately handling four microplates per assay run, greatly reducing required manual technician time while improving the speed and reliability of test results. The SFDA approval for the DSX system is effective for four years and allows Dynex to provide broader automation options to assay developers and clinical technologists throughout China. China’s rapid economic development, especially in the healthcare and diagnostics sectors, continues to outpace that of much of the rest of the world. Duane M. Steele, Dynex’s Vice President of Sales and Marketing, said, “In response to China’s outstanding market outlook, Dynex opened a Hong Kong branch in early 2012. The SFDA approval of DSX allows us to substantially enhance our already growing presence in China, where the ELISA market is still very strong and growing. We also expect that we will seek SFDA approval in the future for our new Agility® 12-plate system.” Agility is a fully automated microplate testing system that was released by Dynex in the fourth quarter of 2012 in the U.S. and many other international markets. The Agility system utilizes state-of-the-art robotics that allows processing of up to 12 microplates in a single run and delivers unparalleled precision while eliminating nearly all manual steps and potential sources of error. More information on Dynex and the DS2, DSX, and Agility systems can be found at www.dynextechnologies.com. About Dynex Technologies (www.dynextechnologies.com): Dynex pioneered microplate technology more than 50 years ago, and has since delivered a series of cutting edge, best-in-class ELISA processing systems, including the 4-plate DSX and 2-plate DS2 systems, and the newly released Agility 12-plate system. Dynex designs each of its products to meet the rigorous demands of scientists in clinical, biomedical, and pharmaceutical development applications. Dynex is based in Chantilly, Virginia, USA, with locations in Hong Kong, Germany and the UK, and markets its products worldwide.